This week we had an interview with Mr. Valeriano Garcia – CEO Globalia member in Madrid, who talks about his company and the challenges facing the freight forwarding industry. A. I started my career in the freight forwarding industry since June 1991. Q. Can you tell us a little about ELS GROUP’ history? A. ELS is a privately owned logistics company which was founded in Saudi Arabia in January 2012. Our company has very quickly evolved into a premier provider of freight forwarding, distribution and warehousing services. The core focus of our organization is to provide our clients with cost-effective and high-tech solutions for their complicated supply chain requirements. Q. What distinguishes ELS GROUP from other freight forwarders in your city? A. Our area of specialization is international transport and multi-modal transport and service. We have been offering complete traffic management services by identifying and evaluating the requirements of the shipper and designing customized shipping programs by making use of the most effective modes of transportation. We provide our clients with a range of logistical services, which include customs clearance, warehousing, distribution, technological services, specialized services for the automotive industry, tailor-made services and much more. Our culture at ELS is marked by a robust “can do it” attitude- on which we count on for resolving challenging issues, carrying out our daily tasks and for coming up with creative solutions for our clients and partners. Q. How is ELS GROUP dealing with their daily challenges? A. Freight forwarding is a global business, which requires us to focus on strong partnership ties between independent freight forwarders and collaborate on more projects as a solid team. However, most freight forwarders fail to grasp the importance of cooperation and teamwork, which is precisely why they miss out on some of the most lucrative business opportunities. Q. How could the freight forwarding industry improve? A. Independent freight forwarders need to become part of a network and stay connected with each other, just like the multinational freight forwarders do. A. Enhancing our IT system and working tirelessly to improve our work relations with the members helps us to get more projects and improve our company’s presence. We believe that teamwork with our partners in various parts of the world is something which can greatly boost our company’s profile. Q. 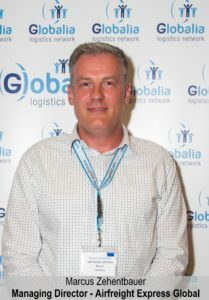 What attracted you most about Globalia Logistics Network? A. Some of the factors that convinced us to join Globalia are the global coverage of the network, its reliability and of course the fact that only quality freight forwarders make it to this network. A. Our most significant shipment so far has been the transportation of 4.5 metric tons of IMO mineral to China in a single shipment. Q. What were the challenges with this shipment? A. Liaising with the port authorities, road authorities, arranging for permits and licenses and negotiating with the carriers for obtaining equipment space within a very tight frame of time proved to be quite a challenge. Consolidated teamwork and our perfect relationship with the carriers, custom and port authorities are some of the factors which allowed us to execute this challenging project with considerable ease. Q. Where do you see ELS GROUP in 10 years? A. For the ELS team, the sky is the limit. In 10 years we will be as high as our efforts can drive us. This week we interviewed Jason Yu, from Shanghai Multiplex Concept Intl Freight Forwarding Co. Ltd, Globalia member in Shanghai, who told us in detail about their company and how they are striving to keep ahead of the competition. Q. Can you tell us a little about Shanghai Multiplex’ history? A. Our company was established in 2006, and since then we have been providing all kinds of international logistics services including air, sea and road freight, custom clearance, import, export, warehousing, door to door deliveries and much more. No matter if the consignments are large project cargo requiring chartered/heavy lift transport or time-critical products where service failure can be critical, we are here to provide our clients with access to all the expertise they might need. Q. Why did you decide to become a freight forwarder, and how did you get into the industry? A. While in university, I did my majors in logistics management and after completing the course I worked at an airport terminal for 5 years. This was when I thought about starting my own logistics company which would offer prompt and creative logistics solutions for the clients and since then I have been working for Shanghai Multiplex. Q. What do you enjoy most about being a freight forwarder? Q. What distinguishes Shanghai Multiplex from other freight forwarders in your city? A. A few things which distinguish us from our competitors are our long years of experience, flexible handling capability, prompt and effective solutions for the most complex shipping needs and the ability to always adapt our services according to our customer’s needs. Q. What are the main challenges facing freight forwarders in your country at the moment? How are you dealing with them? A. One of the major challenges faced by freight forwarders in Shanghai is fierce market competition. We are coping with this challenge by providing the best and most cost-effective services, and by responding promptly to our customer’s requirement. We strive to provide all our customers – large and small, with world-class levels of support, care and commitment. Our ‘customer first’ policy surely helps us to stay ahead in the competition. Q. What most attracted you to Globalia Logistics Network? Q. How did Globalia’s 1st Annual Meeting benefit Shanghai Multiplex? A. The 1’st yearly meeting of Globalia agents went way better than we expected. It provided us an opportunity to know our partners more closely and gave us the confidence to collaborate with professional and reliable agents from all around the world. A. The freight forwarding industry is expected to go through loads of major changes in the coming years, most of which would involve automation and digitization. Electronic transactions are sure to develop step by step and a time will come when the shipper might book space, arrange trucks and go for custom clearance services online. Therefore, we as traditional logistics service provider must also be ready with digitized and value-added services which would be suitable for all kind of customer requirements. This week we spoke to Globalia member in Tema and Accra, Joseph Biney, CEO of BAJ Freight who tells us about the origins of the company and how they established themselves as a pioneer in the freight forwarding industry of Ghana. Q. Can you tell us a little more of Baj Freight? A. BAJ is the acronym for Bart, Ato and Joe. The name BAJ is simply a constant reminder of the hard work of our employees under the skillful management of Mr. Joseph K. Biney, Ato Quagrine and Fred Bart Simpson whose collaboration dates back to thirty-two years ago when they met as employees of Relebo Lines Limited. Q. When did you decide to become a freight forwarder and how did you get into the industry? A.I think as long as there is trading, there would be a constant need for freight forwarders. Hence, I thought of my profession as a calling to this need. Q. What distinguishes BAJ FREIGHT from other freight forwarders in your city? A. What distinguishes us from other forwarders is that BAJ is a pacesetter in the industry. We seek to get involved in a series of industry pilot programmes and developmental corporate social responsibilities such as the BAJ Freight junior Tennis League. Q. How did you hear about Globalia? What most attracted you to us? A. Globalia was recommended by some of my partners in the other freight network associations. BAJ rarely had partners in the areas your members were located hence I felt the need to be a part. Q. What’s the biggest difficulty in dealing with suppliers/factories? A. The problem had always been price undercutting, high rates, lack of proper industry information and time constraints. A.We handled an out of gauge 8.5m exhaust funnel for a thermal plant project where we had to pass under three high tension low hanging poles which connected Ghana, Togo and Cote d’Iovire within 15 minutes. Honestly, I thought this was going to be impossible but we requested the concerned authorities to disconnect the poles one after the other for the funnel to pass and then reconnect the power. Q. Tell us a funny story about a curious shipment you have handled. A. A client engaged BAJ for services relating to customs clearance of general goods. Having communicated the ETA of the Vessel to the client, there was an unfortunate incident which delayed the vessel arrival hence the ETA kept changing. After three communication of ETA change, I got to my office, to find our client with a pillow and mattress saying that he will not leave until we confirm that the vessel had arrived. Fortunately for me, that very day, I received an email from the shipping line saying that the vessel had berthed. Q. How do you see BAJ Freight in 10 years? A. Within 10 years we aim to be one of the top three logistics company in West Africa, using the most sophisticated technologies and implementing global standards in freight forwarding.